Lindenwood panel, 67 x 50. Borgo, 1968 (see below), reported that an old photograph in the Witt Library of the Courtauld Institute “shows that originally the Madonna’s mantle was lined with a filet of gold at the borders and its surface was touched lightly in gold with horizontal strokes.” This does not necessarily mean that the gold was part of the original sixteenth century state of the picture. PROVENANCE: Vienna, Prince Wittgenstein Collection. Samuel H. Kress Collection, 1938. Washington, D.C., National Gallery of Art, Kress Collection. New York, Finch College, Kress Collection, no. 485. National Gallery of Art, Preliminary Catalogue of Paintings and Sculpture, Washington, D.C., 1941, 1, no. 485, Book of Illustrations, 49, as Albertinelli. A Study Collection of Renaissance Art, Gift of the Samuel H. Kress Foundation, Bucknell University, Lewisburg, 1961, 14, 15, Fig., as Albertinelli. Freedberg, 1961, I, 248-249, 607, II, Fig. 325, as Rosso, not later than 1512. Berenson, 1963, 210, as Sogliani. Carroll, 1964 (1976), I, Bk. I, 4-5, Bk. II, 1-73, 83-91, P. 1, II, Bk. III, Fig. 1, as Rosso, around 1513; “Addition to the Preface,” 1976, vii, as not by Rosso. Borgo, 1968 (1976), 168, 170, 365-367, Cat. Rais. I, no. 31, Fig. 43, as probably begun by Albertinelli and completed by an assistant, apparently of 1514. Freedberg, 1972, I, 629, as not by Rosso, and by implication as by the Master of the Kress Landscapes (see Zeri, 1962). Ludovico Borgo, “Mariotto Albertinelli’s Smaller Paintings after 1512,” BM, 116, 1974, 250, as partly by Albertinelli. 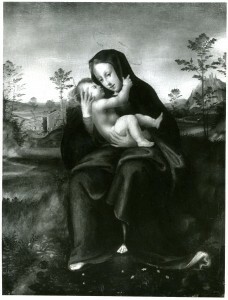 Wilmes, 1985, 87-88, as not by Rosso, and as showing a mixture of the styles of Fra Bartolommeo and Sarto. Franklin, 1994, 8, 271, n. 22, as not by Rosso, with reference to Zeri’s attribution to the Master of the Kress Landscapes. The attribution of this picture to Rosso has now generally fallen away, rightly it seems to me. Freedberg thought it was by Zeri’s Master of the Kress Landscapes. Borgo recognized that it was a variant by Albertinelli and an assistant of a picture in the Pino Guzzardella Collection in Rome (Fig.RP.11 Variant; Borgo, 1968 , 362-364, Cat. Rais. I, no. 30, Fig. 42; and Borgo, 1974 [see above], 248, Fig. 17, 250), which he thought to be by Albertinelli in 1514. From photographs it is clear that the figures in the Bucknell picture are very similar to those in the painting in Rome, but I cannot quite see that the Bucknell picture is even partially by the same hand. It seems rather a more detailed version of the Rome picture with a different landscape very much like those by the Master of the Kress Landscapes, by whom it may very well be. 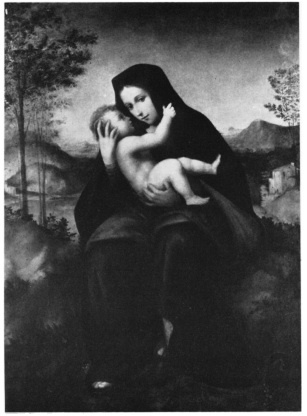 This Borgo also recognized in relating the Bucknell painting to the Madonna and Child from the Uffizi (RP.6) and the Holy Family in the Borghese Gallery in Rome (RP.20). Waldman saw both as by Giovanni Larciani, whom he identified as Zeri’s Master of the Kress Landscapes, in regard to the Rome picture, following upon Capretti, 1996, 153, as c. 1515, as begun by Albertinelli and, from Borgo, finished by an assistant “che non è escluso possa essere il Maestro dei Paesaggi Kress.” However, Capretti noted that Zeri in 1962 did not include the Bucknell painting among the works he assigned to the Master of the Kress Landscapes.